This week I had an opportunity to go out on a research cruise with the Monterey Bay Aquarium Research Institute (MBARI) to do some deep-sea exploration of submarine canyons offshore of the Big Sur coast south of Monterey. This is different field work than I’m used to. 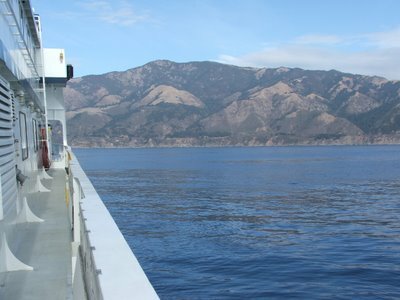 I’ve mostly been studying ancient deep-sea sediments (now exposed in mountains) whereas this trip was looking at modern deep-sea sediments. They drop an ROV attached to a cable from a ship. This ROV can fly around just above the sea floor, has a robotic arm to grab stuff, and a bunch of cameras for observation. The analogy one of the guys on the boat made was — imagine exploring the Grand Canyon by dropping a video camera in a Volkswagen beetle from a helicopter on a cable over a kilometer in length, during a moonless foggy night. 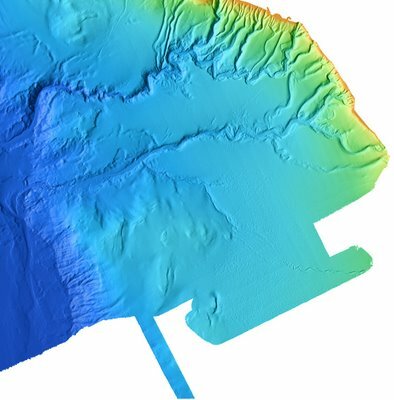 The image above was our view of the Big Sur coastline (you can even see Highway 1 if you look hard enough) while we were sampling one of the submarine canyons below. The image below is an image of the sea-floor topography showing the canyons and channels cutting through the continental margin. The shelf edge is to the right in the orange color and the darker blue colors are getting to deeper depths (image courtesey of MBARI).